Depression is a largely overlooked and much misunderstood disease in the Christian world of books, yet there are vast numbers of Christian men and women who are looking for help with this problem. With an interest stemming from their own experiences, Dr. Bruce Hennigan and Mark Sutton take an approach to overcoming life's difficulties that is grounded in both spiritual and medical principles. 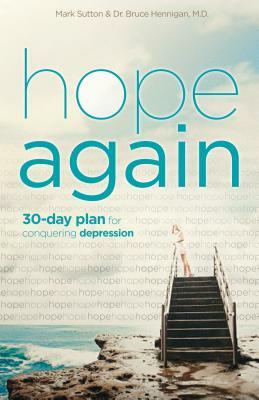 Hope Again: A Thirty Day Plan for Conquering Depression provides step-by-step encouragement and instruction to manage and win over depression. Mark Sutton is the author of three books, as well as a contributor to a Conquering Depression with B&H Publishing. He has published more than 200 articles. His upcoming book is Still God's Man. He and his wife, Donna, currently reside in the Orlando area where he works with Haitians in Florida and in Haiti through Mark Sutton Ministries. Dr. Bruce Hennigan is a physician in the field of radiology, a church dramatist, and a certified apologist. He co-authored Conquering Depression with B&H Publishing in 2001. He is the author of three novels, The 13th Demon: Altar of the Spiral Eye, The 12th Demon: Mark of the Wolf Dragon, and the upcoming The 11th Demon: The Ark of Chaos.